Since my house is already decorated for Christmas (with a Hanukkah vase for good measure), I'm not doing anything special (yet another reason to have this party--decorations are done!). Panoramic of my teeny apt in the midst of decorating 2 week ago. I'm indecisive (LIBRA! ); note clear and white lights. I wanted to show three different options for the bar set ups. Since I will have regular and alcohol hot cocoa, I will have two different areas. I got my glasses at the Dollar Store--no joke. And I love the idea of the clear glass ornaments for cocoa! Cute! 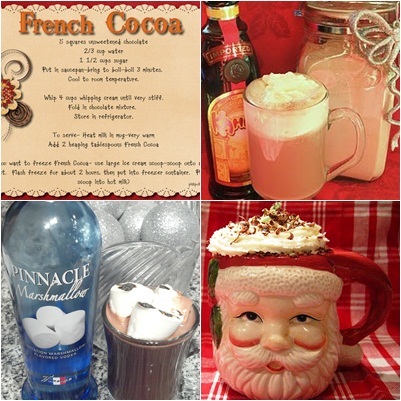 The traditional hot cocoa will be in a Crock Pot--it will make serving/hosting easier. As for the bar-bar, I hate it when someone/hostess gets stuck playing Bartender. I'll have recipes/suggestions written out so guests can fix what they'd like. 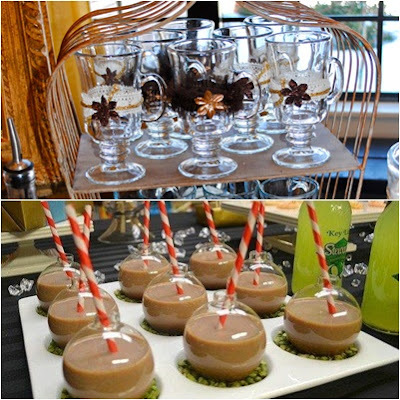 The bottom two pictures are mine--I just made the Spiked Marshmallow Cocoa to try it out for the party (success! ), and the Mint Mocha is from a post last year. Check out my Dollar Tree glass and my Goodwill Santa mug! If I don't go the clear ornament route (I might fill them with dry mix as parting gifts instead), I love these stir ins. 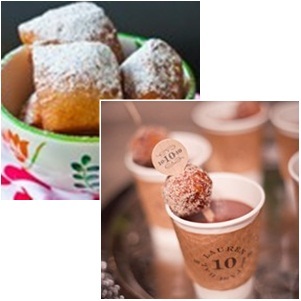 Perhaps a beignet or donut hole would make a nice snack. What do you think? All pics via Pinterest or my phone! What holiday parties are you attending this year? Or throwing? Want another cheap entertaining idea? Here's my Chocolate and Wine Party! This looks so amazing and inspiring! I need to makeover my own bar asap! wow that's some fabulous ideas! I love the whole concept, as I am obsessed with cocoa! I absolutely love this idea. Easy, fun, and perfect for this time of year. This is too cute!! Must swing by the Dollar Store and track down those glasses! Looks beautiful and fun!! I love the dollar store! I find such great stuff there! WOW! you are so creative!!! 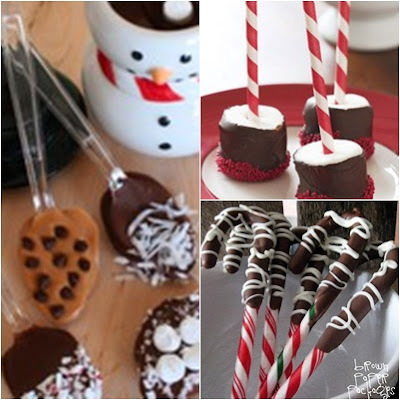 i wish you lived close to me so you can decor and do cute stuff on my birthdays or other activities :) the candy canes with chocolate look SO YUMMIE!!! I so wish I lived near you so I could snag an invite to parties like this - it looks amazing! I love all of these ideas, especially the cocoa in the ornament. The chocolate covered marshmallow are also an easy and fun treat for a holiday party! Love the ornaments as glasses. This looks like it will be so fun! I LOVE those ornament glasses. And they get even more adorable with the addition of the striped straws! Dollar store?! The best way to spread Christmas cheer is singing loud for all to hear! Love this Blogmas post! Oh wow this is totally my cup of tea (or cocoa ;)) LOVE this idea! Oh my word - your party is going to be PHENOMENAL. Wow. I want to come, haha! oh my!! Love this! We host a dessert party every year...but my nephew has a peanut allergy so it really limits what we can make. such a great ideas, I have to try one.Thanks for sharing. Awww, want everything! Lovely tips dear, thanks for sharing them with us! I love this idea! Its so cute! love hot cocoa and bars. the perfect post for me. wow looks very impressive! I wish I was going!! The ornaments as glasses... so clever, i love it! This looks amazing!! How fun! Hi dear, I LoVe the idea of a cocoa bar! I am certainly going to try this, maybe add a bit of a coffee bar too. Thanks for the great idea! ahh so fun! i love the dipped mallows! you're inspiring me to do some baking/goodie making this weekend! Lovely post! Great inspiring blog! This is so much fun!!! I want to go to a hot chocolate party! Umm yum!!! That's a great idea! I'd love to host one of those! So creative Elle! i love hot chocolate. i've been having some just about every morning here lately. (: love the clear glasses! it's amazing what good stuff you can find at the dollar store, no?! Shut up! That looks amazing! This is very festive. It really shows the holiday spirit. I want to try stir ins. I've never had it before. I love your idea of hot coco in a clear glass and they were only a dollar how cool is that. P.s. I never would have thought to put coco in a crock pot what a great idea. Love your ideas!!! Can't wait to use them when I throw a party! PS Have a great time!!!! GAH that's like my dream personified if I had a matching bacon bar as well. Did you try a hot toddy or something? Love all the gorgeous party inspiration! Okay, this is the coolest party EVER. I'm horrible about entertaining (as in, I never do it), but I MUST do this. Thank you for sharing this fantastic idea!! that looks amazing... thanks for your sweet words about my graduation... incredibly I'm thinking about getting another degree... ha!!! OMG, the clear ornaments as glasses is SUPER cute! Really awesome post ;)) Perfect for this day.. I'm Marilyn<--your newest follower with smiles..Really great blog you have here and I'm looking forward to reading and indulging in more around.. Hope you can stop in sometime. http://theartsygirlconnection.blogspot.com ..WIshing you a blessed Sunday.. I love EVERYTHING about this party theme! So much fun. And so much deliciousness. Ok, those clear glasses that you got at the Dollar Store are genius. I love this idea. So clever, Trevor! OMG, best idea, ever. Jut thinking about it makes me happy. I need to do this. Thanks for the inspiration. YUM~~ cocoa bar looks SO cute! Everything looks amazing and delicious! How cute are all of these party ideas. 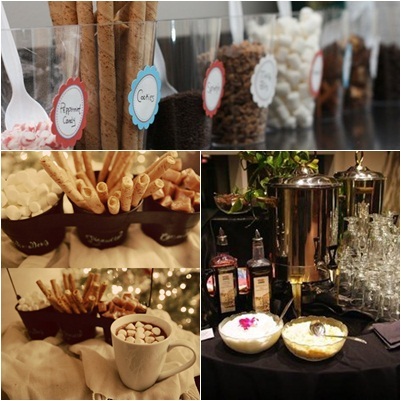 I love the hot cocoa bar. Oooh, beignets!! I'll be home in New Orleans for Christmas and we always go out for beignets on Christmas night. I can't wait! Wow! What a good idea, looks so yummy! I'm a hot chocolate lover, so this post was right up my alley. Love the different ideas. this is such a cute party idea and you had the cutest displays! i love the dollar-store glasses you used! I may have to try this one out next year!